Before I got caught up in my recent kaftan, linen shift, and apron saga, I spent a few interesting days drafting a top for jeans. I’ve always loved a white blouse/jeans combo. Trifecta – I used three patterns! 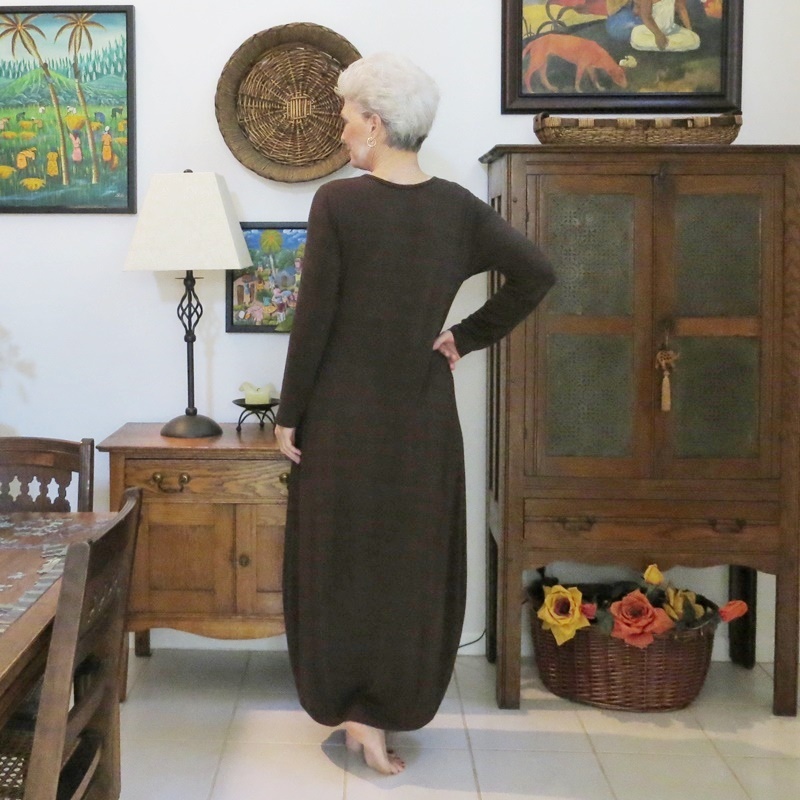 The sleeve is from the Allie Olson Highlands Wrap Dress, the front bodice from the V-neck variation of Grainline Studio’s Alder dress, and the back is from The Sewing Workshop Trio Top. A kickback to the 70’s – I think I’d really like it in white cotton jersey as well. I’m working on my True Bias Yari jumpsuit, and this morning hit a critical point. Buttons! After I decided on my button (which will be revealed with the post on the finished garment), I moved on to the buttonholes themselves. I always put together a test piece, built exactly like the area in which I’ll put a buttonhole. Outside, interfacing, facing, edge-stitching, the whole ball of wax. For this garment, which I’m sewing in Essex linen, I decided on a rounded-end buttonhole, with a wider stitch (1) to add a little chunkiness (appearance) and (2) to protect the inherent loose weave of the linen (utility). At the same time, I tested the presser foot pressure (released for linen) and the upper thread tension (also released). When I first starting using my Juki HZL F600, I ignored the optional footplate of the buttonhole presser foot. No more! It really helps the fabric glide, any fabric, and is a terrific option. Last note on this: I never clip my threads on a buttonhole. Instead I take the front threads to the back and weave everything into the back buttonhole stitching. I just think loose, cut threads on the outside ruin a buttonhole. Finishing them only takes a little time. 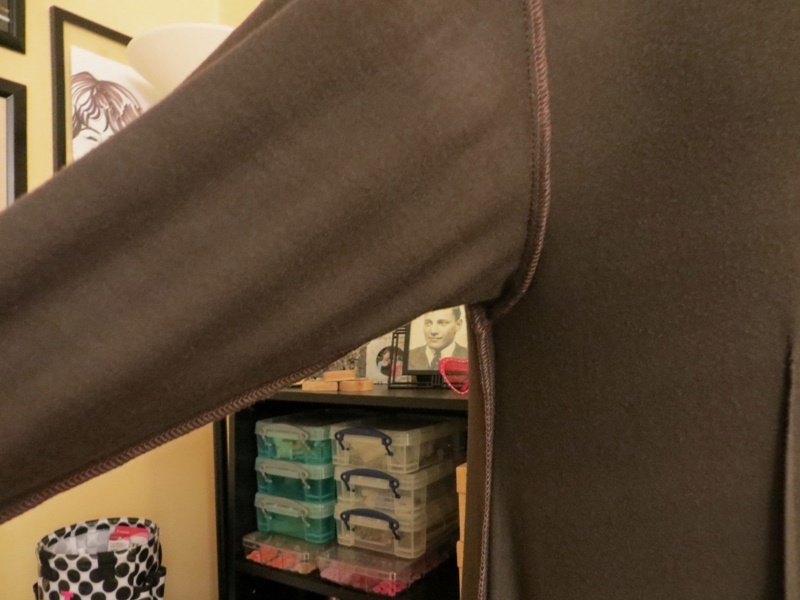 New PJs – essential sewing! At last, cool weather has arrived. For those of us in south Florida, that means night temperatures in the fifties. Not cold! But what a difference. Our dry season has begun, with lower humidity and the beautiful temperate days that bring so many people to Florida for the winter. Best of all – open windows, fresh air, and no A/C! I get the urge to sew new PJs in the fall and in the spring. I’m wearing these as I write, and I might not take them off until next year! It’s my only matching ‘winter’ PJ set – I admit that most of my PJs are collection of T-shirts and leggings that have been downgraded from the closet to the drawer 🙂 Terrible… and I plan to grit my teeth and do something about that! Soon. 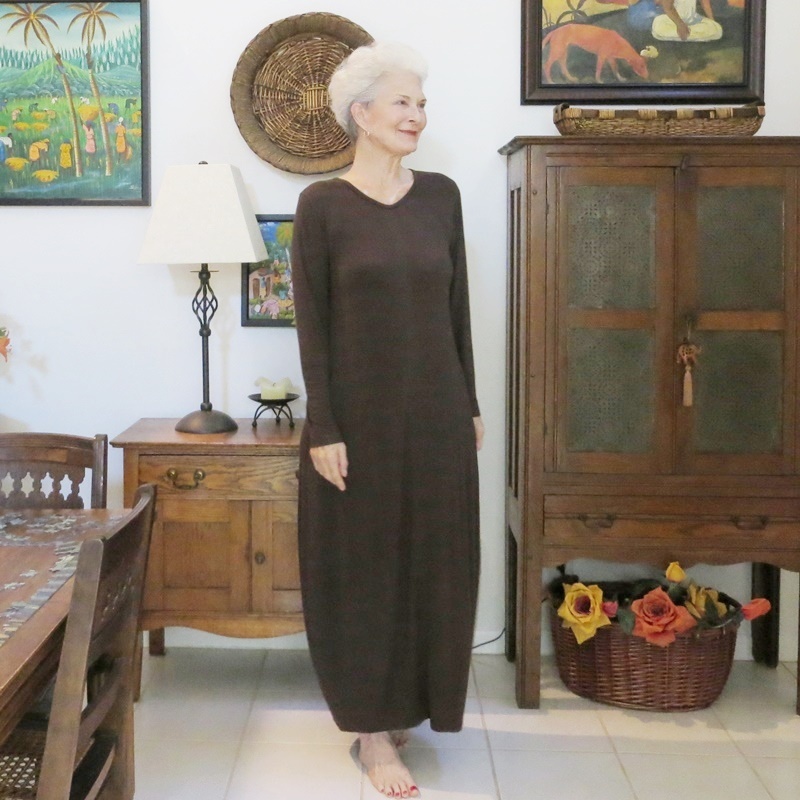 The top is a modified Wiksten tank, and bottoms are Love Notions Sabrina Slims. These are two great patterns that I’ve used over and over. The Wiksten top is designed for woven fabrics, and I’ve sewn some cute sleeveless versions in simple cottons, but it works beautifully with knits as well. In a totally different direction, I just finished a nightgown that’s pretty enough to wear all day. I’m so in love with this rayon challis print from Cali Fabrics. The gown is a mix of elements – I used a favorite bodice sloper, with a 1.5″ wide waistband (it’s faced on the inside), and a gathered skirt that’s simply a 50″w x 38″l rectangle. I hope everyone has a nice weekend, spent doing favorite things. Such trepidation – a collar. I’m not a fan. But I’m always willing to check myself, particularly when working with such a nice looking pattern. Plus I’m in search of a short top that will work with my ‘shaped’ Lagenlook pants. The very small collar is a real draw – could it work? Ummmm. No. My opinion (the one that really counts) is that collared shirts make me look like I have a chicken neck. Scrawny. Arising from any button-front with a yelp that says ‘look at me – skinny neck, big head’. That said – Emile is modeling for me today. But she is exactly my size, so the proportions and promise are all there. It’s such a nice shirt. Beautifully drafted, with informative and sensible instructions that make it a great project for advanced beginner and beyond. It’s just beautiful. And for a collar, not so hard to construct. I don’t enjoy sewing collars with bands, but this one only took me about 100 hours – LOL. 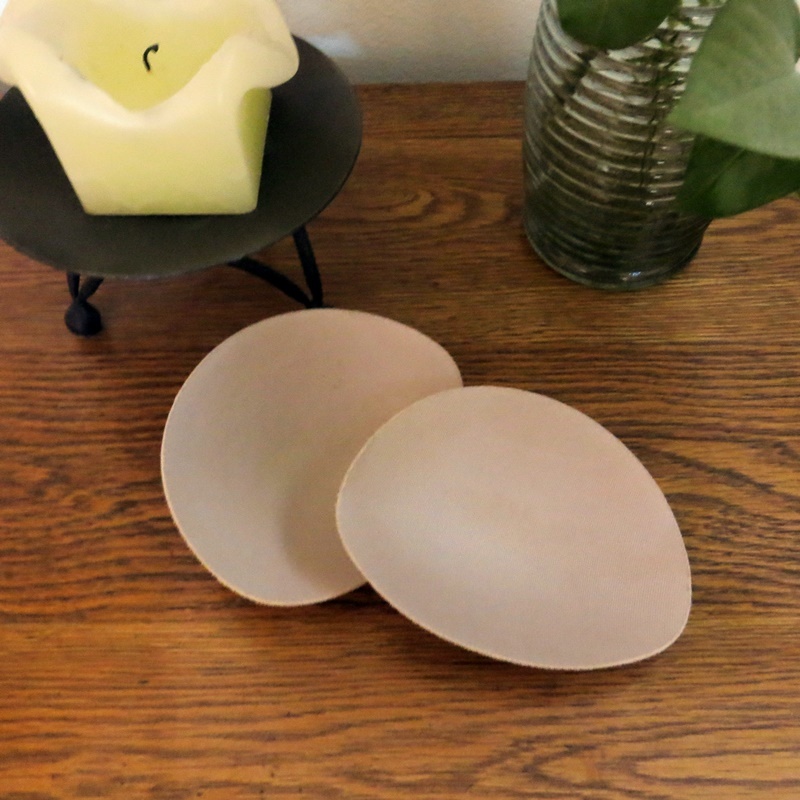 On the inside – the facing is really well done, no wrinkles in the fit or wearing. The full facing is really critical, since it means that the inside looks as good as the outside, if the shirt is opened to a lower button. 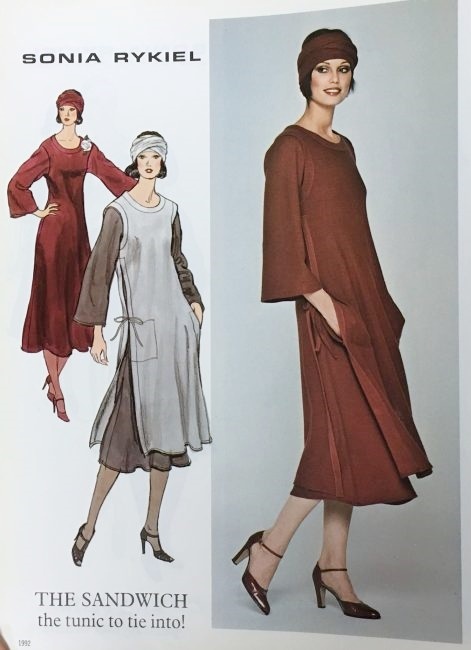 The sleeve – Linda Lee drafted the shoulder, and extension into a dropped sleeve, with a curve over the outside top of the shoulder. That makes all the difference in how this sleeve works. It doesn’t stick out at all. Really nice. 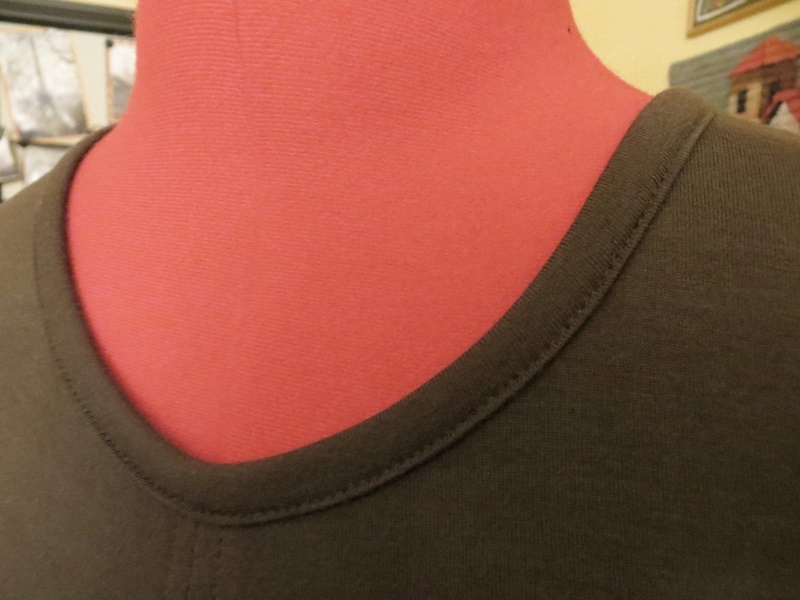 My favorite design detail, and one that I will draft into something else really soon, is the back yoke. It’s a dropped and gathered insert – just lovely. This runs VERY large. I did a lot of flat measuring and ended up sewing the size XS. Which is over 10″ of ease for my 35.5″ bust. I cannot imagine wearing a larger size (I’m a Vogue 12, StyleArc 10). Importantly, the shoulder, neck, upper back, and upper bodice fit really well. I only deviated from the pattern in one area: I did not band the sleeves. The band would have put 6 layers of fabric in the sleeve edge, which I thought would stiffen it too much. Instead, I serged the side seam/sleeve edge, hem to hem. 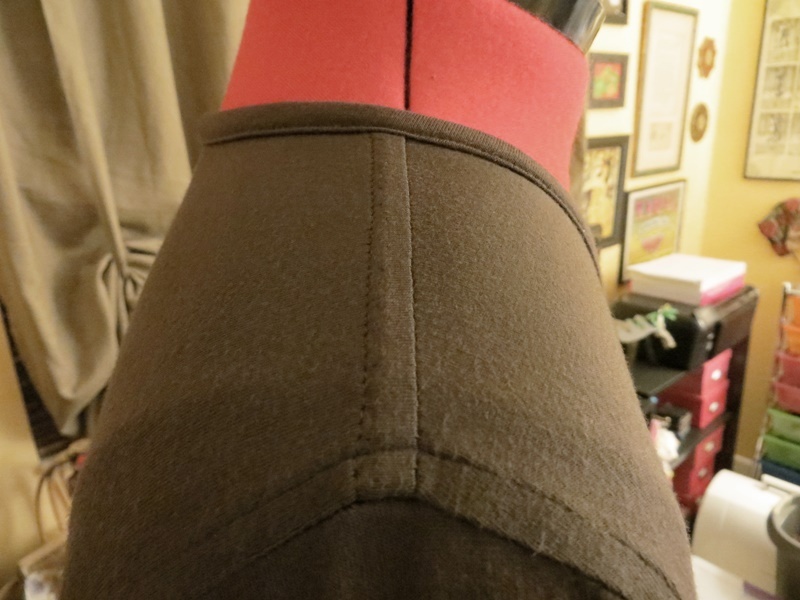 Then I stitched the side seams, turned in the sleeve 5/8″, and topstitched around the sleeve area. It’s all done except the hem, but I think I’ll let Emile wear it for a while while I work on the Trio pants. 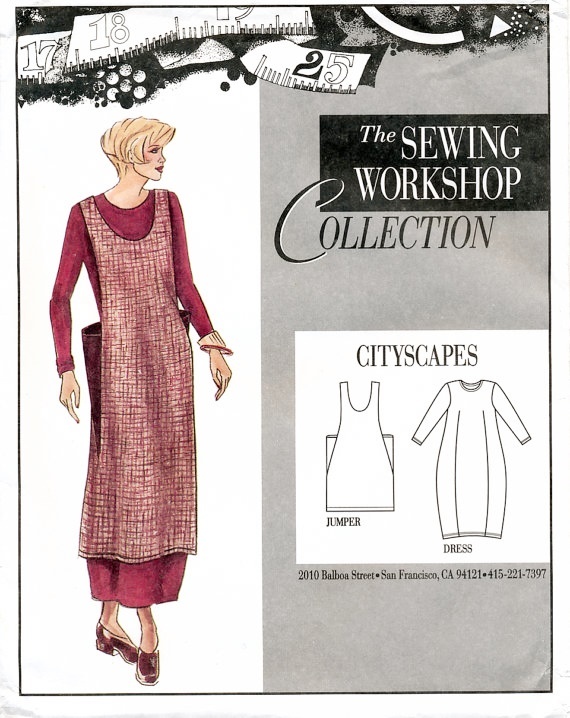 This is my second Sewing Workshop pattern, and I think Linda Lee’s designs and drafting are wonderful. Happy New Year! 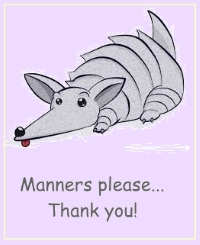 and my apology that I’ve been slow to respond to comments on the blog. Busy time! 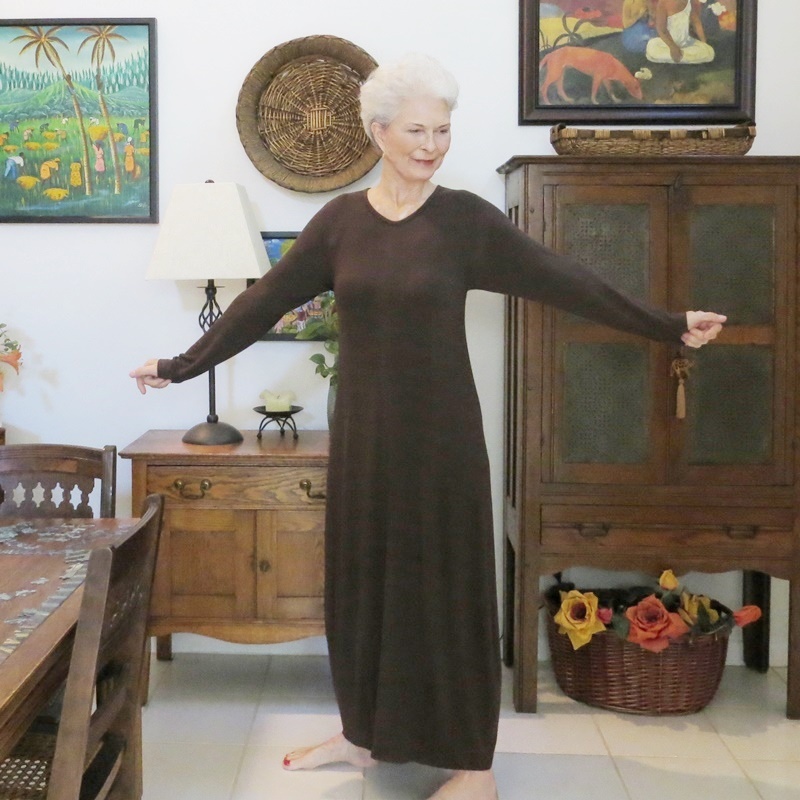 I was so excited to get back to sewing after all my visiting with family – because I found a new pattern one night, while watching The Christmas Story and cruising the web. This is Linda Lee’s Cityscapes dress. I think it was first released around 2002, along with an apron-like topper. 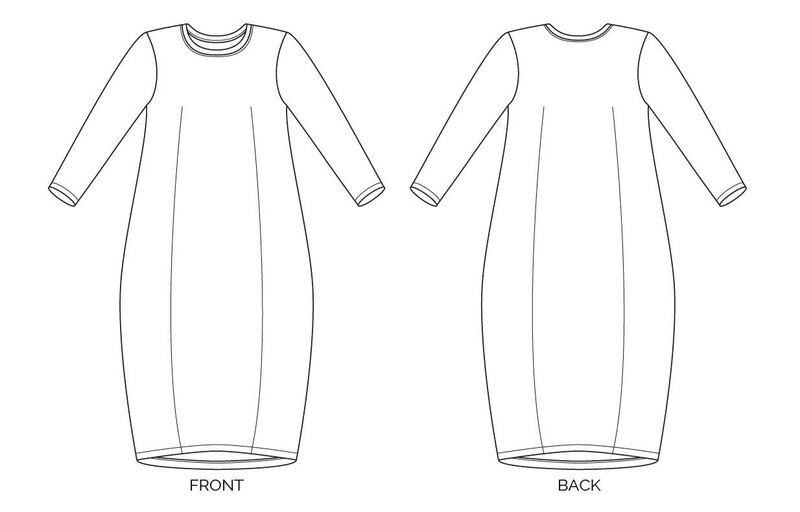 And now the dress, by itself, is available from The Sewing Workshop as a PDF download. My first Sewing Workshop pattern! The original release reminds me of Sonia Rykiel’s Vogue 1379 Sandwich Dress from 1976. 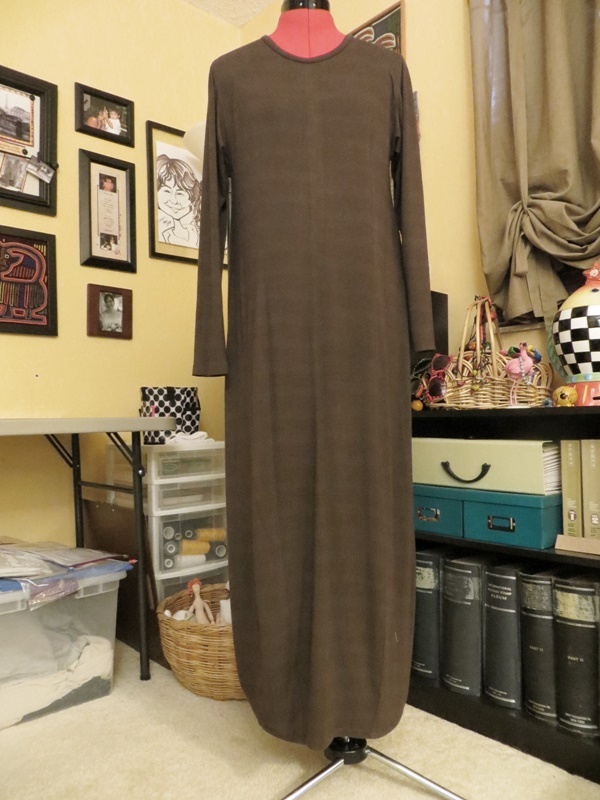 My fabric is deep brown and does not photograph well, so I lightened all the pics a bit. Squint please. Sewing this pattern was so much fun. It’s a little quirky, but goes together beautifully. The pic below shows the basic layout of both the front and the back. I had to sit and look at it for a while. I knew the dart was continuous, bust/upper back to hem. 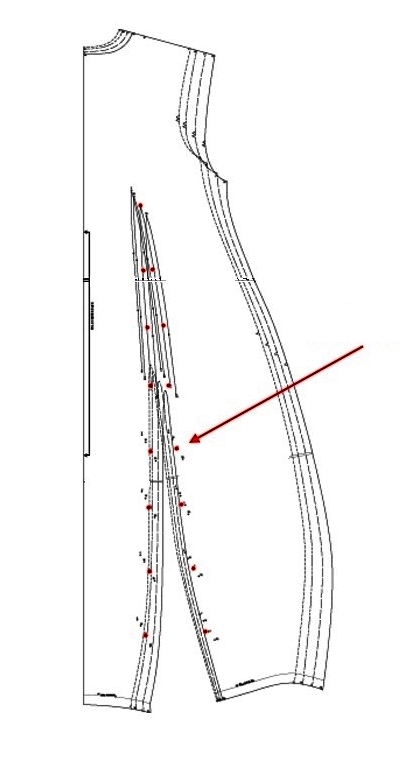 But part of the dart, the ‘bell’ curve, is removed when the pattern is cut out, not when it’s sewn. Once I played a mental game of connect the dots (there are a generous number of them, defining the dart sewing line), I was OK. There are four sizes on the pattern, so I just had to be careful not to stray out of my size. I used a tailor tack at each dot, and then drew the sewing lines with a chalk marker. Perfect and not difficult at all. A couple pics on Emile. The inside – I was very short on fabric with only 3 yards, so I cut the front in two pieces instead of on the fold. The center front seam is pressed opened and topstitched down. And the outside. I could have cut the back in two pieces instead of the front, but I try to avoid center back seams on a knit dress. They tend to stretch out at the stitches and just don’t wear well. I sewed the size Medium, which was perfect. 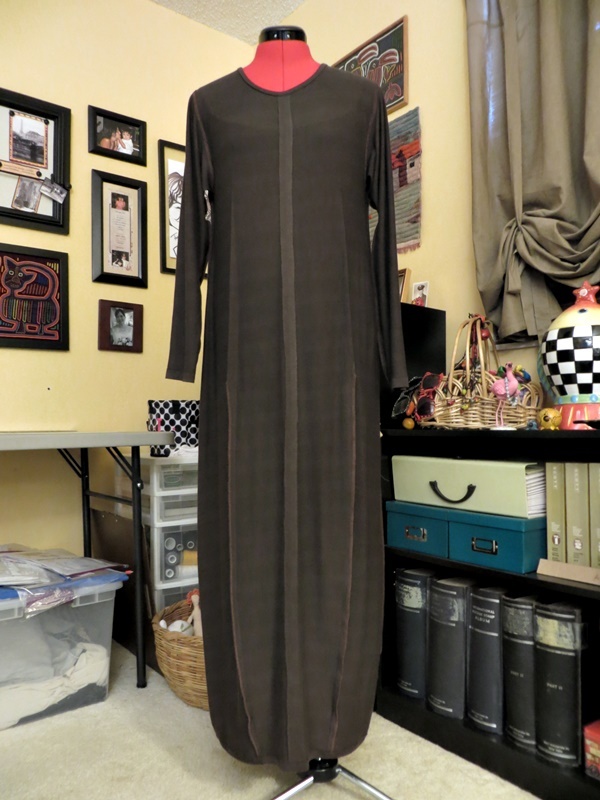 The sleeves and the hem were long enough for me (I’m 5’7″), so both might be a little long on someone shorter. However, the pattern has lengthen/shorten lines in the sleeve, torso, and skirt, so alteration would be easy. 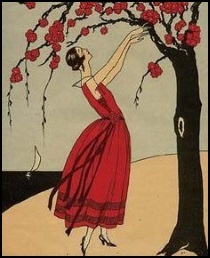 A few sewists mentioned a concern about the width of the hem and ease of stride. So I added 4″ at the hem (1″ on each side, back and front) and cured it back into the pattern about 12″ below the waist. It worked great, and I’m glad I added to the width. The shoulders were a little wide on me, so I trimmed off 1/2″ at the outside of the shoulder and redrew the armscye to accommodate the change. The sleeve cap was fine without any changes. 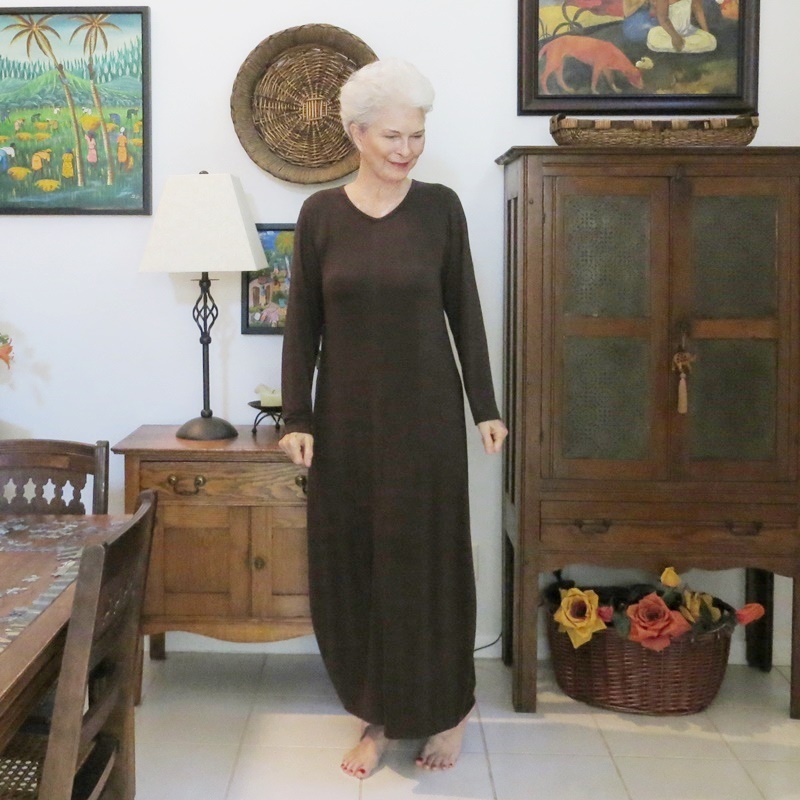 I used a very lightweight rayon/lycra knit with 4-way stretch, which is heavenly to wear, but requires some careful finishing. Particularly because it wanted to run if I pulled at the cut edges. What!? I picked this up from Fabric Mart’s pre-cut fabric sale for a couple dollars a yard. It’s not great fabric, the color is a bit uneven, almost stippled. But it was perfect for this muslin version of the pattern. My shoulder seams have a enclosed strip of knit tricot fusible, cut with the grain to reduce stretch in the fusible and stabilize the seam. I finished the seam with a flat fell on the inside and topstitching outside. I used an elastic stitch throughout, including the darts and hems. And serged/cut all the long seams together at about 3/8″. The armscye seam is pressed toward the dress and topstitched (visible in the last pic). Borrowing an expression, I’m pretty chuffed with this dress! And I plan a follow-up soon, in a nicer fabric.